Adobe Indesign is one of my tools of choice when designing print-based projects. Generally speaking, I like InDesign and feel comfortable with its user experience. That being said, there are those sticky little issues in InDesign (as with practically any application) that sometimes make things more difficult than they should be when creating a document. In specific situations, “Snap To” can be one of those irritants. Don’t get me wrong, snapping is an essential feature in any layout application. 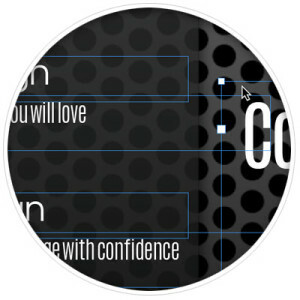 Its extremely helpful for precise layout alignment and I wouldn’t want to work without it. The problem with “Snap To” is that it can sometimes work against you when you attempt to drag and drop a given element to a very specific point in your layout. You may have experienced the following scenario. You’ve created a document in Indesign and you need to drag a text box (or any element) to a very specific position so that it lines up with another element on the art board. You zoom in your view of the layout, select your chosen text box and begin dragging it to the position where you want it to appear. You’re element is almost in position and “SNAP”, the text box jumps to another location. Repeated attempts meet with the same results. You just can’t seem to move the element to the exact position without it snapping to a guide or the document grid. Certainly you can correct this issue by selecting “View > Grids & Guides > Snap to Guides” from the menu and unchecking the “Snap to Guides” feature. But a more elegant solution would be if you could temporarily disable InDesign’s “Snap To” feature while positioning your layout element, then reenable snapping when correct placement is complete. Thankfully, this is a very real possibility. To temporarily disable snapping in InDesign, simply select and begin dragging your chosen layout element. At the same time, press and hold the “Control” key while dragging. Move the element to its proper position and release it. That’s it. No snapping. This is a welcomed solution that works like a charm if you use the Mac version of InDesign. I tried the same “trick” with an older version of InDesign (CS6) running on one of our Windows workstations to discover that I was not able to turn off snapping by simultaneously holding the “Control” key. This feature may have been added in subsequent Creative Cloud versions of InDesign for the PC but I am not aware of it.